Watching the solar eclipse in Reykjavik, Iceland. 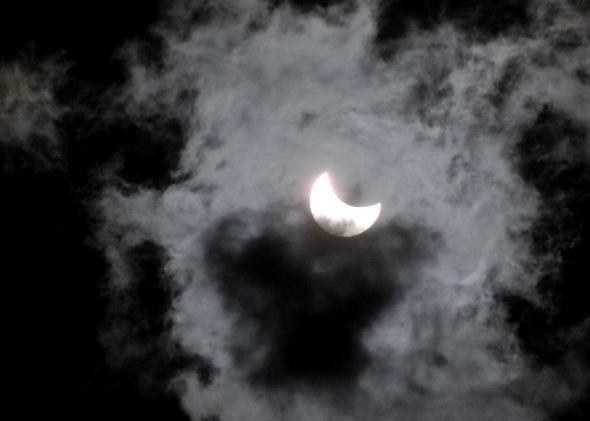 This picture, taken through a filtering device, shows the solar eclipse in Sarajevo on March 20, 2015. REYKJAVIK, Iceland—Friday morning’s total solar eclipse—the awesome spectacle produced by the moon passing directly between the sun and Earth—was an alignment of the heavenly bodies that from time immemorial have defined humanity’s conception of just that: time. It also made a great excuse to take a trip to Iceland with my brother, and made me pretty hungry. This total solar eclipse was the first since Nov. 13, 2012, over Australia and New Zealand. The next one to hit North America will be on Aug. 21, 2017. Europe won’t see one again until Aug. 12, 2026. But this week’s eclipse was a holy trinity: a total solar eclipse on an equinox with a supermoon. As a layman, I wasn’t quite sure what that meant. But that’s why God invented Google: A vernal equinox marks the astronomical end of winter—and occurs when the sun’s rays hit the equator head-on, causing day and night to be equal. A supermoon is either a full or a new moon during the moon’s closest approach to Earth in its orbit. Every once in 100,000 years or so, you get this special type of solar eclipse— at least according to an article on Inquisitr, an online news site that I had, of course, never heard of. I was a bit skeptical, but the 100,000-year figure stuck with me. (It soothes the mid-30s–bachelor’s ego to tell his Facebook friends that—in contrast to their engagements, weddings, and childbirths—he’s seeing a once-in-a-hundred-millennia event). Around 10,000 years ago, the last Ice Age ended, agriculture was invented, and the first human town—Jericho—was built. About 100,000 years ago, humans left Africa. Of course, all this is a small speck in time. Life first developed 3.8 billion years ago. The sun was created 4.5 billion years ago, as were Earth and the moon, formed from debris leftover when the planet was hit by another large celestial object. The universe itself is 13.8 billion years old. And that’s to say nothing of the future, which the BBC was helpful enough to timeline out in the near and far term—before the sun swallows up Earth about 5.4 billion years from now. But who can even contemplate that? Besides, I had no idea if that 100,000 figure was actually accurate. I was saved by an email from a Canadian professor: Jaymie Matthews, professor of astrophysics at the University of British Columbia. Matthews informed me that he is “in charge of Canada’s first space telescope” and that “I am allowed to put ‘O.C.’ after my name, as an Officer of the Order of Canada (the Canadian version of a knighthood, sort of).” Perfect. Yes, he used that emoticon twice. He’s good. Which brings us back to our Airbnb in Iceland, where my brother, 42, is watching “Batman through the ages” as I write this story. This morning, I woke up naturally to sunny skies and looked out the window exactly two minutes after the eclipse began, at 8:38 a.m. The eclipse would reach its full extent here (nearly 98 percent of totality) at 9:37 a.m. That left us an hour to find protective glasses. But protective glasses were sold out in Iceland, Google helpfully explained. So we walked out the door at 9 a.m., carefully avoiding gazing directly into the sun as the light slowly softened. Everywhere people were stopping—tourists, construction workers, mothers with their children—to gaze up at the sun through filters of every sort: safety goggles, photographic film, even the hole inside a CD. (When was the last time you actually saw a CD?) Except for the half of people who were walking around as if nothing was occurring. We reached the shore, where skygazers were clustered. A German couple let me use their glasses just in time to catch a new-moon–like sliver of the sun made by the (actual) new moon. Near darkness descended. And then just as quickly, the light came back on, the tourists cleared out, and we debated where to eat. For that, we could turn to religion. After all, the eclipse also coincided with Nowruz, the Persian New Year. According to Inquisitr, some Christian ministers predicted it’s a sign of the apocalypse— a prophecy only heightened by the fact the eclipse left Earth over the North Pole. Da da dum. Or perhaps we could turn to Viking mythology, in which two brother wolves, Skoll and Hati, chase the sun and the moon across the sky. When they catch up, there is an eclipse. In Vietnam, people traditionally believed that an eclipse occurred when a giant frog was eating the sun. In China, it was supposedly a dragon taking its bite. As for breakfast, I had the “healthy brunch” with sunny yellow eggs at a faux French bistro in town. My brother had a croissant with black coffee. The last vestiges of the eclipse passed overhead at 10:39 a.m.